Classic English Scones – These deliciously fluffy scones are perfect served warm or cold with clotted cream and jam. Pair with your morning cup of tea for an indulgent breakfast! One of my favourite things to have for breakfast is a scone (or two! ), spread with some strawberry jam, and a dollop of clotted cream. I pair with my morning cup of tea for a totally comforting breakfast. 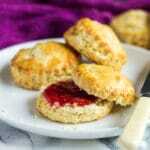 So, today I bring you my Classic English Scones recipe! 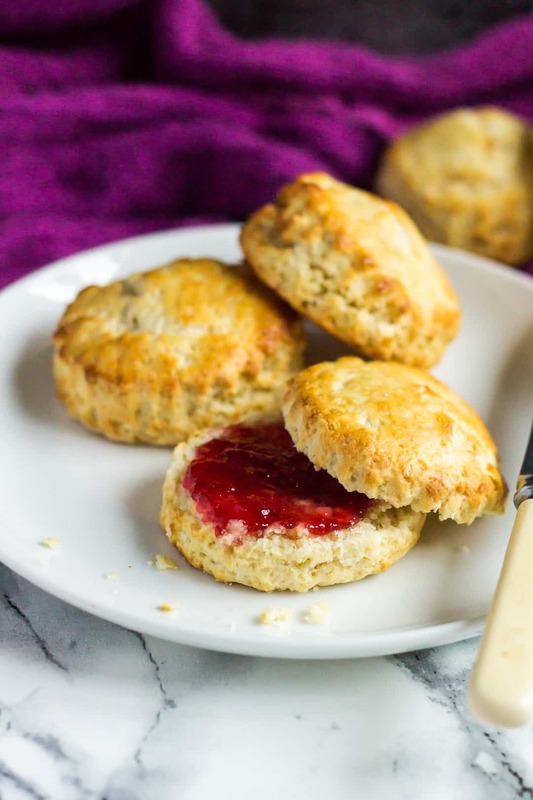 English scones are made differently from American scones, and instead of being stiff and dry, they are light, fluffy and soft. They’re absolutely delightful, and a must-try. 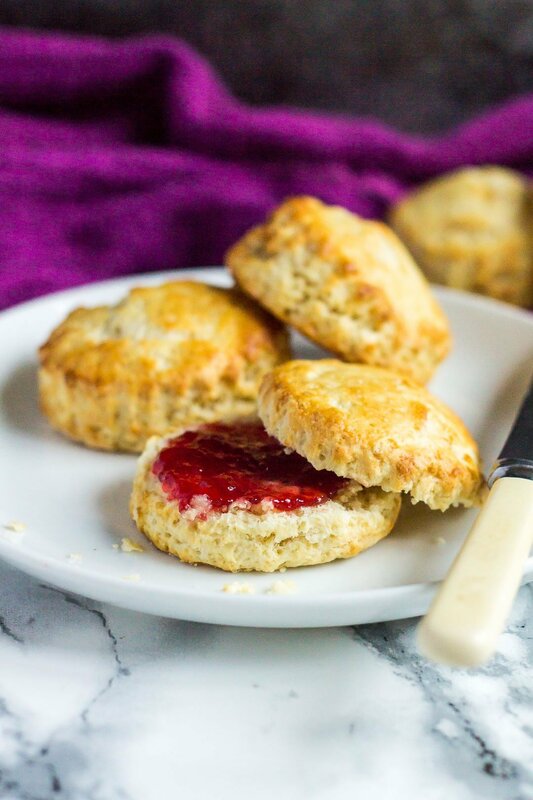 These scones are super quick and easy to throw together, and only require a few simple ingredients you probably already have at home! These can be made by hand, or for quick preparation, you can use a food processor. 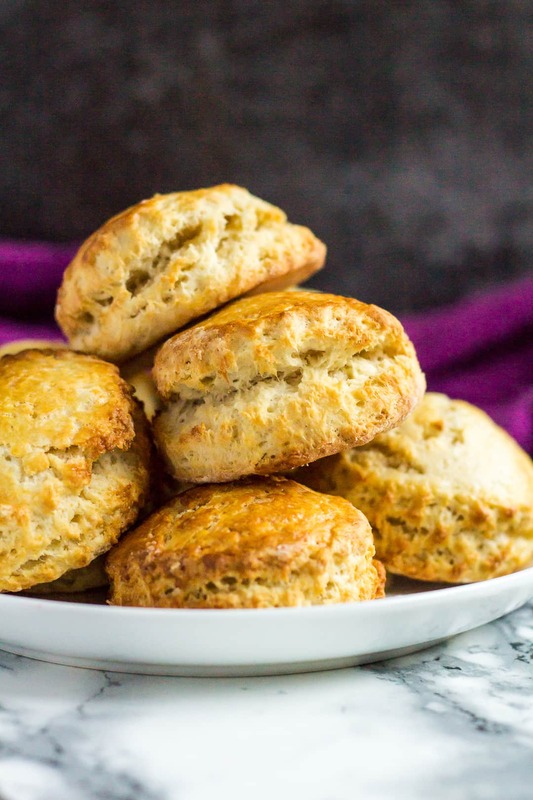 Simple ingredients = DELICIOUS scones! 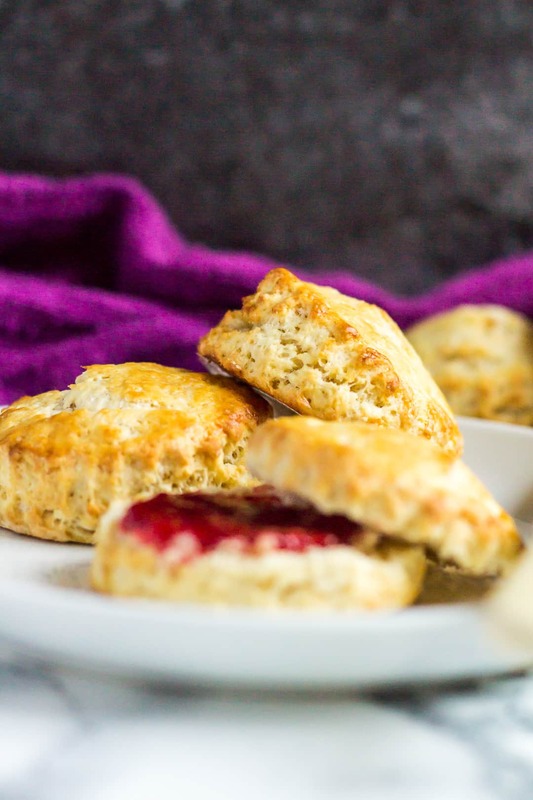 What I love about this recipe is that these scones are freezer-friendly. I like to make a few batches, keep them in the freezer (for up to 3 months), and when ready to eat, simply leave them out overnight (in the fridge or at room temperature). Perfect for a quick breakfast, or for entertaining guests the next day. Leftover scones can also be kept in the fridge for up to 5 days. If you like your freshly baked scones though, you can make the dough as instructed, wrap in clingfilm, and keep in the fridge for up to 2 days. Or freeze for up to 3 months! 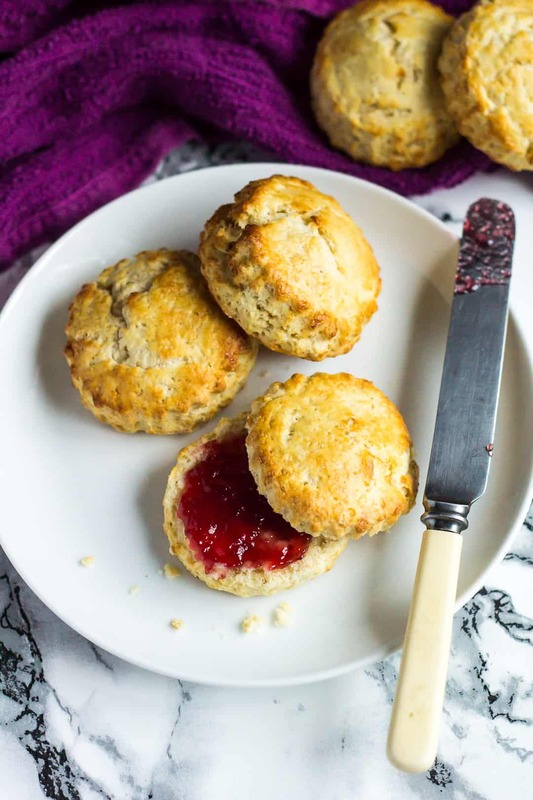 To make these scones by hand, simply whisk together the flour, sugar, baking powder, and salt in a large bowl. Using your fingers, a fork, or a pastry cutter, combine the butter into the flour mixture until it resembles fine breadcrumbs. You may also use a food processor for this step. Add the buttermilk and vanilla, and mix until a soft dough is formed. Turn the dough out onto a lightly floured surface, and roll out to a thickness of 1-inch (2.5cm). Grab a 2-inch (5cm) fluted or round cookie cutter, dip it in flour, and cut out circles from the dough. You should get about 8 – 12 circles, after re-rolling. Place on a baking tray lined with parchment paper or a silicone mat, brush the tops with extra buttermilk, and bake for about 15 minutes until risen and golden brown. Serve warm or cold with clotted cream and jam, or simply spread on some butter! freezer-friendly – perfect for making ahead of time! Try these breakfast ideas next! These deliciously fluffy scones are perfect served warm or cold with clotted cream and jam. Pair with your morning cup of tea for an indulgent breakfast! Preheat the oven to 220C/425F/Gas 7. Line a baking tray with parchment paper or a silicone mat, and set aside. In a large bowl, whisk together the flour, sugar, baking powder, and salt. Add the butter and, using a pastry cutter, fork, your fingertips, or a food processor, work it into the mixture until it resembles fine breadcrumbs. Stir in the buttermilk and vanilla until a soft dough is formed. Turn the dough out onto a lightly floured surface, and roll out to a thickness of 2.5cm/1-inch. Dust a round or fluted 5cm/2-inch cookie cutter with flour, and cut out circles from the dough. Re-roll any scraps, and cut out more circles. Transfer them to the prepared baking tray, and brush the tops with extra buttermilk. Bake for about 15 minutes until risen and golden brown. Serve warm, or cold with clotted cream, jam, or butter. Leftover scones can be kept, covered tightly, at room temperature or in the fridge for up to 5 days. They also freeze well for up to 3 months. Thaw overnight in the fridge before serving. You can make the dough ahead of time. Simply make the dough as instructed, wrap in clingfilm, and keep in the fridge for up to 2 days, or in the freezer for up to 3 months. Thaw overnight in the fridge before continuing with the recipe.